The new UWP range has updated user functions, all metal casings, back-lit displays and much more - providing the user with a compact, rugged wireless microphone system for use with any camcorder or as a stand alone system. The new UWP-V2 system comprises of a portable/camera mountable receiver and a handheld transmitter. 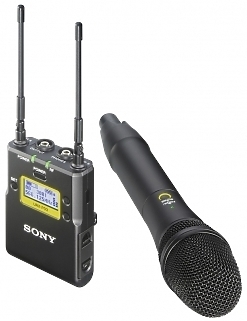 Also included in the pack are all the necessary accessories to provide a fully operational wireless microphone system. Teaming "plug and play" simplicity with stable performance and extended battery life, there is a complete range of Sony wireless transmitters and receivers to meet the needs of ENG/EFP, presentation and live performance. If you're looking for all the benefits of interference free wireless operation at an affordable cost, finding the perfect solution is now easier than ever before with the adaptable new UWP range.